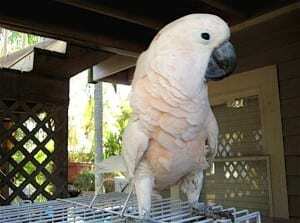 Bird's Talk - Florida parrot sanctuary & rescue - M.A.R.S. Every bird that passes through the doors of M.A.R.S. has it’s own unique background story to tell. Bird’s Talk is where we let you hear their stories. Where did they come from? How did they get here? How far did they travel? Their adventures are really quite astounding and told straight from the beak! And as every bird owner knows, each bird has it’s own very distinctive personality and many are quite the storyteller! Every week we feature a new tale. Hear the adventures of Woody, Paco and Slick and other family members of M.A.R.S. in their own words! 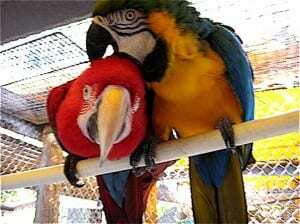 Bird’s Talk is the really fun way to get to know our feathered family here at M.A.R.S.! My name is Woody, and as far as I can remember, my story started, if time serves me well, sometime back around 1979. I was probably around six to eight months old when I left my first family and went to live with my new one. You might think that since I was so young that I would have been very scared to leave all that felt so familiar and safe to me. I however don’t think that I was afraid at all. I actually think I thought it was a great adventure, and let’s face it, I hadn’t really been out of the nest very much and I was ready for some excitement. After being transferred from my cage, to what I now know was a car, a Porsche to be exact, my journey into life was about to begin. More later and I will tell you all about the red guy in the picture with me…. Hello, my name is Slick, I no longer live at the rescue sanctuary but you might say that with out me none of this would have ever happened. All of the birds that followed me are so lucky that this place exists. None of them would ever know the simple joys of everyday life had it not been for me. How I came to this place is a miracle in itself. At one time I lived in Georgia, and my parents were not bad people, just not good bird people, and then again perhaps I was just hard to deal with. One day I tried to tell my mom that I needed a bath, and what I got was a soaking – and a really hard one. So the next day I started to pluck myself. I didn’t just take a few feathers, I took out quite a lot. I think that at this point they decided that they had had enough, and low and behold they started to look for a new home for me. As my luck was running out I didn’t hold out for much good to come of the situation, but well, you can always hope for a miracle can’t you? So I really thought hard about what I would like my next home to be. I thought it would be nice if it was warm and tropical with trees to play in, yes I know about trees ( I am a bird after all)! I hoped that maybe I could have some friends as we all really like being part of a flock ( you know the bird thing again)! Well time went by and nothing looked like it was going to happen, so as you can imagine, I got really depressed. I lost weight, lots of weight. And I stopped complaining, I just simply didn’t have it in me any longer to even give anybody any grief. One day while I had about given up, I mean really given up, my parents came into my room started packing up my things, all toys, food , everything. I wasn’t scared!! I was excited!! Maybe I thought my thoughts and wishes had been answered? And so began my 12 hour journey to where I could not tell you, as I was almost completely in the dark for most of the time. Food and water were minimal at best, but since I was already on a starvation kick, no big deal. My appetite was practically non existent. Where I came to next was as much a surprise as any bird could hope for. First I can tell you it was warm, not exactly sure what month it was , but again, it was warm, so I figured we had taken a trip south (don’t all birds want to fly south)? I can honestly say that, I felt something really good was on the horizon for me! I just wasn’t sure what exactly it was. Did I mention that I arrived I the dark? So I actually had to wait another day for this all to show itself to me… Well as the sun began to rise so did my new life, all I could see around me was trees and all I could feel was warmth from that beautiful sun. Things were looking pretty good from this point of view. Did I mention that I was stil in a cage looking at this view? The bars did kinda get in the way of this view. Still this was looking better than any scenery I had in the past, bars or no bars. Have a thought or comment? Or perhaps your bird has a story of it’s own you’d like to share. Contact us – we’d love to hear from you!